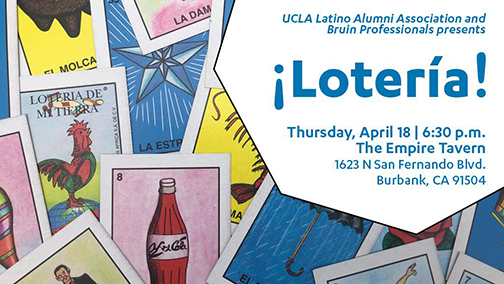 Join ULAA and Bruin Professionals (BP) to try your luck at the traditional Mexican game of chance, ¡Lotería! Mix and mingle while indulging in special Bruin Happy Hour pricing on craft beers at The Empire Tavern in Burbank, which is Bruin-owned by Xicana alumna Corissa Hernandez, M.A. ‘06. Suggested donation of $10 upon RSVP. Space is limited.